First a caveat: I'm a triathlete. My review is solely from the point-of-view of a triathlete who's used the Garmin 910XT exclusively for nearly two years. It may be that none of the cool features or issues I've experienced apply to you. My motivation for getting the Garmin Edge 510 was the larger screen and thus, the ability to view more data points at one glance rather than having to scroll like I have to do with my 910. Many of the other selling points (color screen, Bluetooth, touchscreen, live tracking, real time weather, etc...) don't really do it for me. Sure, the live tracking is cool, but unless I'm racing, I don't need the entire Internet knowing, within 10ft, where I am on the planet. Part of the draw of training is completely disconnecting from the world, not becoming MORE connected. Setting up the device was a mixed bag: the large screen is great, but the touchscreen is kludgy and doesn't always recognize intentional finger presses. As someone who does full stack Java development and UI development, the UI is pretty bad. It's not polished and it looks terrible. It's functional, but it's SO basic it feels like it was designed by a kid in elementary school. That said, it's mostly obvious what each item does when selecting and adding all my bikes was pretty painless. With the exception of heart rate, pairing all your ANT+ transmitters (speed/cadence, power, etc...) is done at once and on a per bike basis. If you aren't using Bluetooth, just a tip to disable it as it'll only help in draining your battery and I've had many friends who've left it on in transition in races and it's gotten confused with all the other electronics present that it doesn't record anything (or if it does, it did so sporadically). I believe, however, Bluetooth is required for the live-tracking feature and for wirelessly downloading your data to Garmin Connect. Setting up the data fields in my screens was a snap and like my 910, there's gobs of data points for those statistically inclined. I use seven fields on my ride (in no particular order): lap time, lap power, 3s power, lap speed, lap distance, lap cadence, and lap heart rate. The data is displayed in five rows and as more fields are added the number of rows increases until five are displayed. When less than five rows are displayed, the rows (and thus the data text) become larger. This is a nice feature for those folks who might be visually impaired. To switch screens during a ride, simply tap the screen and select either the left or right arrow that displays at the bottom of the screen. I'm used to buttons for everything so the fact that the navigation buttons are rendered is a bit odd. 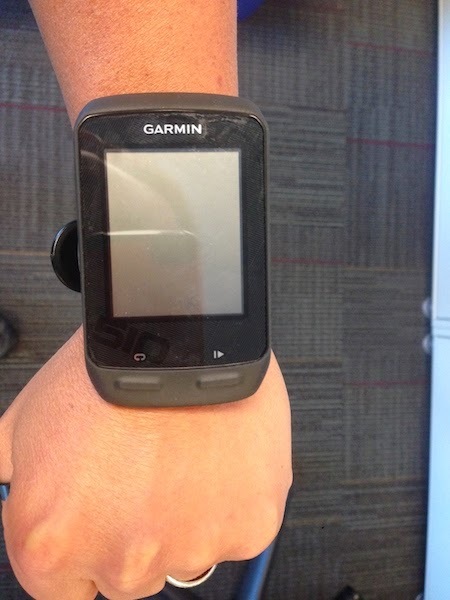 There's plenty of room on the device for more buttons but it's like Garmin was going for a minimalistic design. The lap and start/stop buttons, however, are actual buttons. Prior to riding a quick spin of one's pedals is enough to wake up your ANT+ devices and the Garmin will tell you what it's found. One really annoying thing is that it will not prompt you to calibrate your power meter. You should ALWAYS do this before a ride to ensure consistent and accurate readings and the 910 does prompt you, but for whatever reason, they didn't make the 510 do this. Instead, the calibrate feature is buried under your current bike profile and is accessible by tapping on the dumbbell icon. This icon is only present and clickable if a power meter is currently paired and connected. I found that calibrating a PowerTap hub is significantly faster (at most a couple of seconds) than doing the same for my Stages power meter which has taken up to 15 seconds. If you start moving and neglect to press start, the 510 will helpfully tell you that motion has been detected and tell you how to start your data gathering. I have the 510 mounted on my stem which I'm sure is what Garmin has intended. Unfortunately, I ride a tri bike and instead of my head being higher up and a lot further back like on a road bike, it's low and forward. This makes reading the screen a little more challenging and if you have a positively angled stem, you might find reading it impossible. Mounting on your aero bars is a possibility, but the unit is so big it not only looks ridiculous, your forearm will touch it when riding aero and I don't know about you, but I don't like any distractions when working out or racing and this is a huge distraction. The other major issue with the stem mounting location on a tri bike is that it's so strategically placed that when riding in the aero position, sweat droplets come off my head and fall directly on the large screen of the 510. Thanks to surface tension and friction, the droplets just sit there making it hard to read. Wiping them off is actually worse because not only does it smear and dry with opaque, white, salt streaks, now the touchscreen has, for some reason, become super sensitive and all that touching makes the 510 more than obliged to pop up menus and options over the top of your data fields. I've ordered a 510-specific Zagg screen protector for it and will try putting some RainX on the Zagg to see if that helps act as a sweat repellant. I've also ordered a silicone case for the 510 just in case I drop it. The screen is large and all it has to do is fall face down on uneven ground to get a nice scratch or crack. And you just know Murphy's Law dictates that it WILL land screen side down if you do drop it. After your ride, hitting stop won't automatically save your workout. You are prompted to either discard or save it. This is another change from the 910 and I think is completely unnecessary. Just save the data, and let the user delete it after they sync. I've not tried the wireless synching because it requires Bluetooth and a smartphone app. It does work with Garmin Express, but you have to use the USB cable because the device cannot, apparently, transmit via ANT+ to Garmin Express. You have to turn the device on before connecting the USB cable or it will think you just want to charge the unit and won't turn on, even if you press the power button. I am very happy to report that it works great with the Training Peaks Device Agent and works just like my 910 - even better actually since the software hasn't yet been updated to reflect the new file storage location for Garmin Express with the 910. I should note that the .FIT files Garmin creates for your 510 workouts remain on your device and ARE NOT transferred to your hard drive when synching. If you want a backup of your data separate from Garmin Connect (or Training Peaks, ...) the 510 mounts like a USB PIN drive and you can see the data in your OS' normal means of browsing an attached drive. In fact, this is from where the Training Peaks Device Agent pulls your workout data. Bottom line, as a whole I'm not thrilled with the device. It's certainly not meant for triathletes and as a whole is just a poor user experience with a kludgy UI and ornery touchscreen. That said, the most important feature for me was the large screen and easy viewing of my data points and if I can solve my sweat droplet problems, it's good enough for me. I will say that I'm quite curious to try it out on my road bike to see if some of the annoyances will either go away or become less.